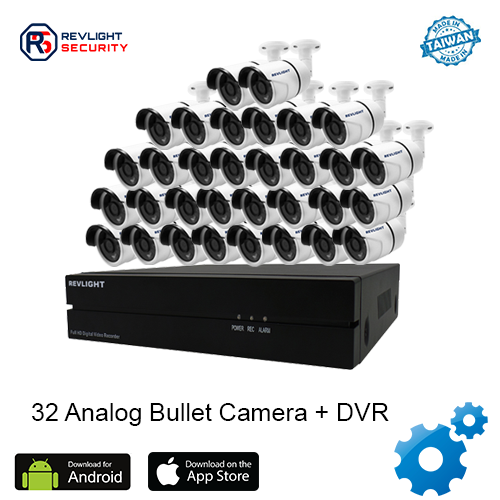 Our 32 Camera DVR Security System Consists of 32 analog camera including one 32 channel dvr system with 5 TB video recording storage, which has 1 year warranty. Improve Employee Productivity With A 32 Camera DVR Security System. Installing a 32 Camera DVR Security System has many benefits, saving employers money in the long-run including improving employee productivity. With a resolution of 1080, you can keep an eye on your employees with a clear picture. Both outside, in the yard, and inside the store our cameras come protected by weather-proof housing made to withstand even the coldest winters. The easy-mount brackets keep installation onto either the wall or ceiling simple so you can position them as needed. These best HD CCTV security cameras are some of the best, small analog cameras you can buy. 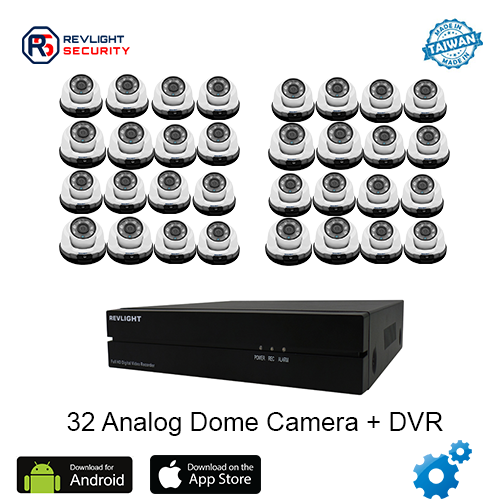 Experience High Quality Night Vision With Revlight Security’s HD CCTV Security Camera Systems. If your employees know you are keeping an eye on them, they work harder increasing their productivity and your bottom line. With a 32 surveillance security system, you business will not only be safe but can be more profitable. Call our Revlight Security CCTV Team experts today for a free consultation at +65 6678-6557.